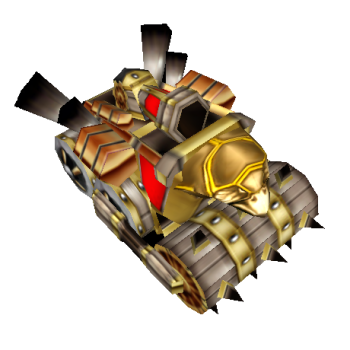 This ground tank is one of the first powerful tanks, especially because of his ultimate. Before using his ‘Hail of Bombs’, you can conveniently use his stun (‘Aiming Rocket’) to orient the tank on the intended target, which is also effective to catch or even kill fleeing opponents, since the rocket can be fired over a long distance. Also, the Heavy Tank has his advantages at sieges with his ‘Mortar-Teams’ outranging towers. The only downside is his basespeed, which results in bad mobility and may require an early speed or teleport item to be compensated. Fires an aiming rocket on an enemy, damaging and stunning it. Calls 3 Mortar-Teams, which cause great damage against buildings. but have a small amount of Hit Points. They can attack buildings only. Fires 5 clusters of bombs in a straight line in front of the Heavy Tank.